Joe Quinones' interweb-log: Joe Quinones' interweb-store: Now Open! 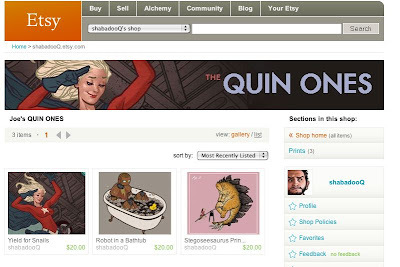 Joe Quinones' interweb-store: Now Open! That's right, ladies and gents! You now no longer need to wait until you see me at a comic convention or arts sale to purchase my wares. You can now do it from the comfort of your home online! The future is now! So far I've only got my prints up for sale, but I'll be adding t-shirts soon and possibly original art. Stay tuned. that's how all those damn telemarketers address me!! either that or Qui Nones. GREAT bunch of new posts here too. Awesome! Let me know if you need help!